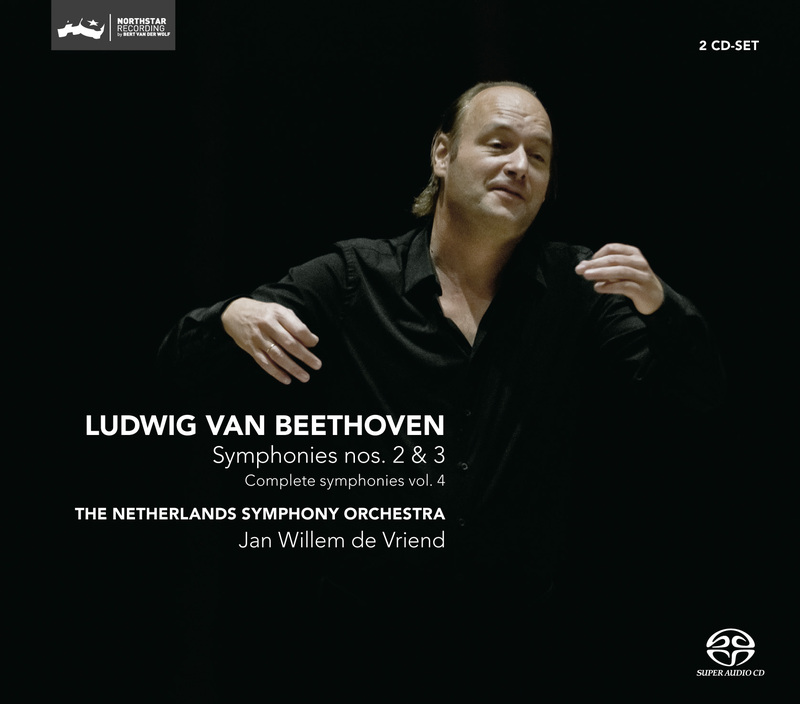 A refreshing new recording of the Beethoven symphonies (volume 4), through the eyes of conductor Jan Willem de Vriend and his orchestra. De Vriends name as a symphonic conductor is emerging fast now in the music world, and this first volume of the Beethoven series is a fine musical signature, with which he and his musicians perpetuate themselves. In the linernotes with this CD we can read: I heard your ballet yesterday and it pleased me very much! ", so said Haydn to Beethoven in 1801, to which Beethoven replied: O dear Papa, you are very kind; but it is far from being a Creation. Haydn was surprised and almost insulted by this remark, and he retorted;That is true; it is not a Creation and I can scarcely believe that it will ever become one. The myth of the Titan Prometheus as it was used by the Italian dancer and choreographer Salvatore Viganò and Beethoven in the ballet was not entirely in accordance with the Greek original. In the version of Viganò and Beethoven, Prometheus shaped human civilisation: he was a philosopher and teacher, not a victim who spent many years chained to a rock. Prometheus sculpts two creatures from clay and gives them the fire he has stolen from the gods, thus animating them. It is the only way to impart knowledge and culture to his creations (i.e. mankind). Unfortunately, Prometheus pays for this with his life. But … of course this version has a happy ending, thanks to the intervention of the god Pan, who brings him to back life. Prometheus is then praised by his two archetypal creations for his heroic deed. According to Lewis Lockwood, the Prometheus ballet, composed in the winter of 1800-1801, paved the way from the Second to the Third Symphony. It is widely known that the finale of the Eroica uses a theme from the ballet. Kinderman goes one step further, saying that Beethoven also used many other symbolic and dramatic elements from the ballet in this symphony, and not just in the finale. But back to the Second Symphony. Beethoven composed it during a time of deep personal crisis. His health, and his hearing in particular, was fast declining; he felt isolated and depressed. The situation was so serious that there were times when he no longer wished to live. At least we can deduce this from the famous Heiligenstadt Testament, which he wrote to his brothers (and to humanity) in 1802. He wrote it, putting more or less all his thoughts on paper, and then filed it away. It would not resurface until after his death. The music of the Second Symphony exudes Beethoven’s desire to rise above his personal difficulties (although naturally traces of his misery as well can always be found in his music). Lockwood: “His ability to nurture his creative psyche and protect it from the physical and psychological anguish of his growing deafness is one of the more remarkable features of his life. "de Vriend takes A lively approach to this music, and there us a palpable sense of energy in every phrase."